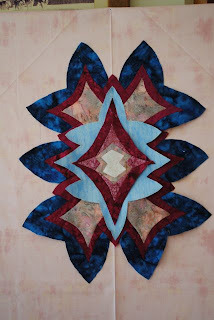 Remember the Crystal Quilt class that I was taking with Dena Crain through Quilt University? I blogged about a design I had come up with a few weeks ago. I was in the middle of piecing the center section when travels interrupted me. 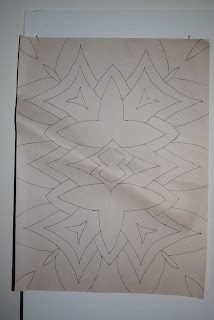 Last week, I completed the outer ring of the center and was able to pin the entire design on my design wall. At the time of the photo below, the very center was not yet attached and had 1/4 inch seam allowances as when I was cutting it out, I wanted to reserved the right to decide on applique versus piecing for later. 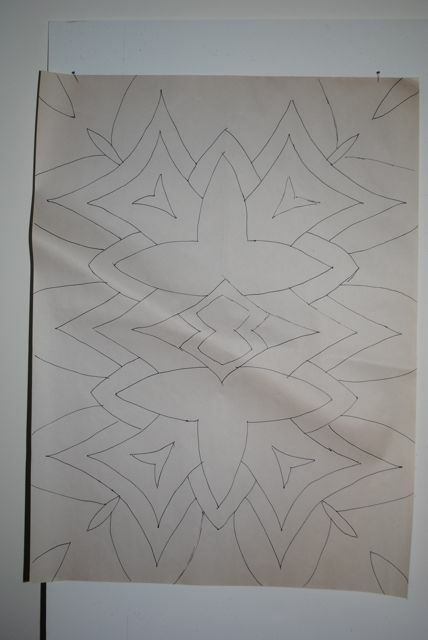 Also, on the photo, some of the design is not yet visible as I will reverse applique the 'darting' shapes that shown in the sketch above. I had planned to put the figure on a gold background. But, I didn't care for it when I had pinned it up on my design wall. I bought some pink fabric and I think that is what I will use. Any opinions? I think the design pops much more against the pink. I also haven't decided on the final color(s) for those darting shapes. The border will be the dark blue with a strip of probably the light blue, if I make this as an art quilt. That was my original intent. I intended to do some decorative stitching and some beading. However, as I looked at the figure on the background, I began thinking that it might make a nice lap quilt. 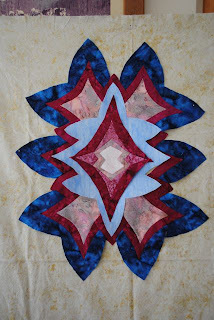 I could see free-motion quilting the shape of the 'leaves' in blue radiating out from the design. Any opinions on that too? Much thanks for any input. I like the pink background. It seems to go well with the red. I think the pink does pop the image more...makes it stronger than the yellow. Your photos and write-up are great, Judy. I agree with Margaret, though, that the design is a floating motif. To anchor it into the design space, either permit the motif to touch the borders, or incorporate those missing corner shapes (appliqué? ), to reduce the amount of visible background (pink is definitely better; why introduce yellow at this stage when there is nothing else there in yellow?). Great job! Please don't forget to post the finished quilt photo on the Finishing School at Quilt U! !